Article 1: The Sedgwick Effect: An Inspiring Interview with Dave North of Sedgwick! Article 2: An Opportunity to Participate! This week I had the absolute pleasure of interviewing Mr. Dave North, a person I have long admired. As most of you already know, Mr. North is the CEO of Sedgwick Claims Management Services, Inc., where he has dedicated the last 24 years of his professional life. Sedgwick seems to cast a wide net when it comes to charitable donations, giving back, and volunteering. No matter whom I speak with at Sedgwick, they are consistently involved in some kind of fund raising, volunteer work, or charitable activity. Claims is a business that by it’s nature, is about helping people who have been hurt. ~35,000 people will wake up today, go about their normal lives, and unexpectedly something bad or injurious will occur. Whether it’s getting into an accident, hearing bad news from a doctor, or something else. That’s a lot of people! At Sedgwick, employees strive to be the person on the phone who says, “it’s going to be okay; we will get you through this.” As a result, Sedgwick recruits workers who are compassionate – people who will take that extra bit of time to give reassuring encouragement. Mr. North prides himself on the fact that an important part of the corporate culture involves a strong charitable footprint. He enthusiastically supports charitable efforts at local offices and encourages employees to select projects or organizations that are meaningful to them personally. 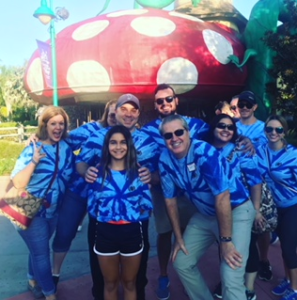 We in Florida get to see the Sedgwick effect through both the financial generosity to GKTW and the hard work of Mr. Doug Clark organizing the Volunteer Day. When Mr. North noticed the incredible effort Mr. Clark and the Sedgwick team were putting into the Volunteer Day, he made it a priority to encourage this high level of activity with financial backing and showing up himself to work on the manual labor projects that Mr. Clark coordinates every summer. It’s the same with other charitable projects at offices all over the world. Several offices organize fund raising to support wish trips for Make-A-Wish-Kids around the country. Other offices are working hard to promote children’s education and health care, including a project in Africa to focus on educating women about cervical cancer. Many of you would be surprised to learn that Mr. North began his working life as a firefighter. From there he enlisted in the Air Force to become a better fire fighter. After fighting enough fires, he decided to get a degree in Fire Protection Engineering – to try and figure out a way to prevent the fires. I think this is probably the source of all that compassion and caring. Even though he is no longer a fire fighter, through his leadership at Sedgwick, Mr. North can continue helping to improve lives and aid those in difficult situations. When I think about the politically divisive and often superficial world that we live in, I find that focusing my time and energy on charitable work and giving back, brings everything back into focus again. Organizations like Sedgwick, and people like Dave North, inspire me to work harder and do more to help those who are less fortunate. As Mr. North stated to me during the interview, “think of the impact we could make, if every individual engaged in some kind of charitable giving and volunteer work”. It sounds to me like he’s way ahead of the rest of us, just by supporting and encouraging his 22,000 employees at Sedgwick to make these activities a priority in their daily lives. Thanks Mr. North, keep up the excellent work! We are thrilled to have reached these numbers but we have even bigger plans! Our goal for fundraising is continuing to grow and this is where we need the support of all individuals and companies. WCI has an opportunity to continue making even more of an impact for the Give Kids The World Village. 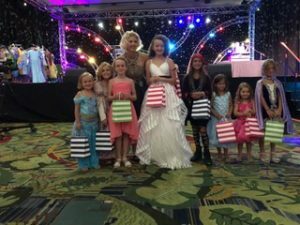 Please consider sponsoring at the 2019 WCI GKTW gala being held Saturday, August 10, 2019 at the World Center Marriott. 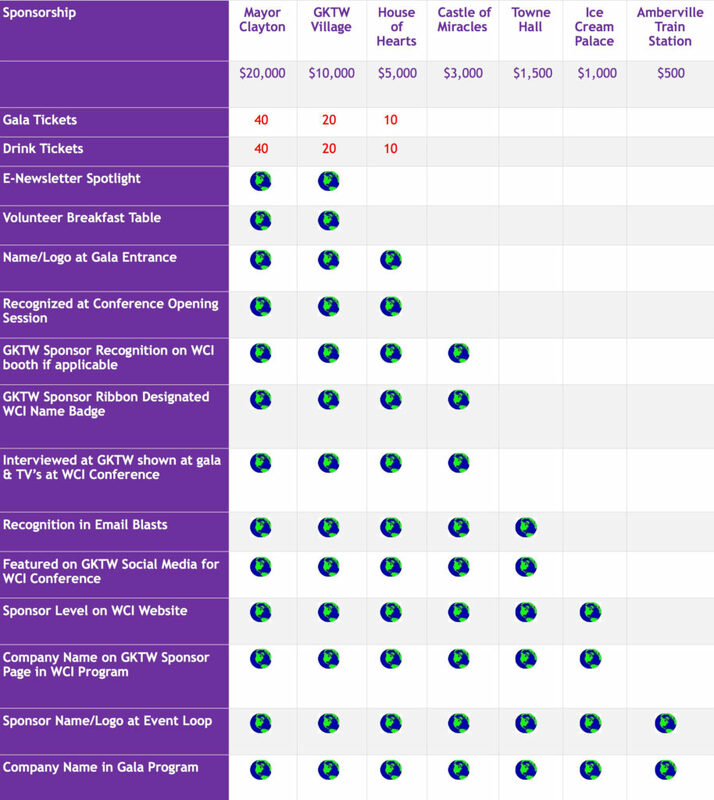 Information about the sponsorship opportunities are outlined in the chart below.